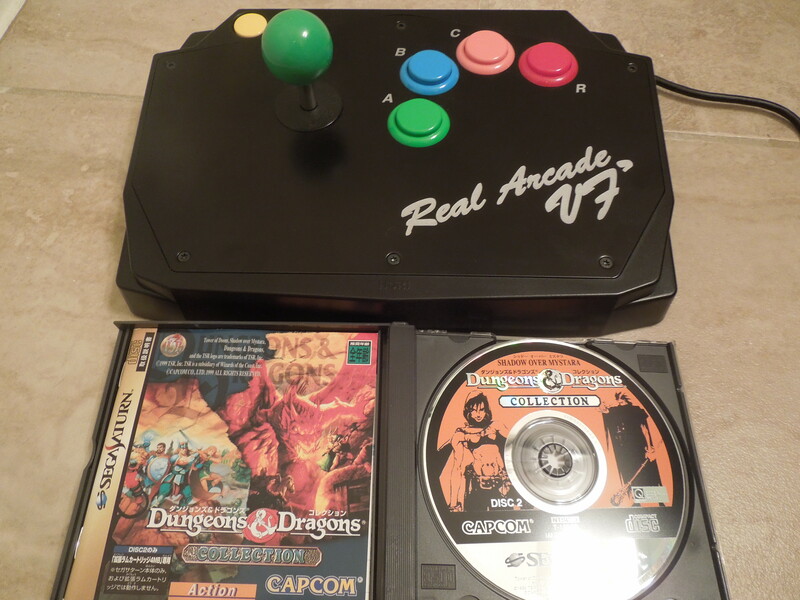 Shadow over Mystara and the Saturn’s Real Arcade VF dash controller (see my review of the controller) are a great match. Note 1: Like Beat ‘Em Ups? Check out my reviews of Crows: The Battle Action, Bare Knuckle III, Double Dragon II, Mighty Final Fight, Sengoku 3, Warriors of Fate, and of course, D & D: Tower of Doom! Note 2: This game was played on a U.S. Sega Saturn with a 4M Action Replay cartridge plugged into the cartridge slot to allow Japanese games to play on the console. The console was connected to a 32-inch HD tv using S-video cables. Note 3: Ok, so I cheated on this review a bit – it’s very similar to my Tower of Doom review, since the two games are so similar. If you want to skip to my comparison between the 2 games specifically, scroll to the bottom of the review. 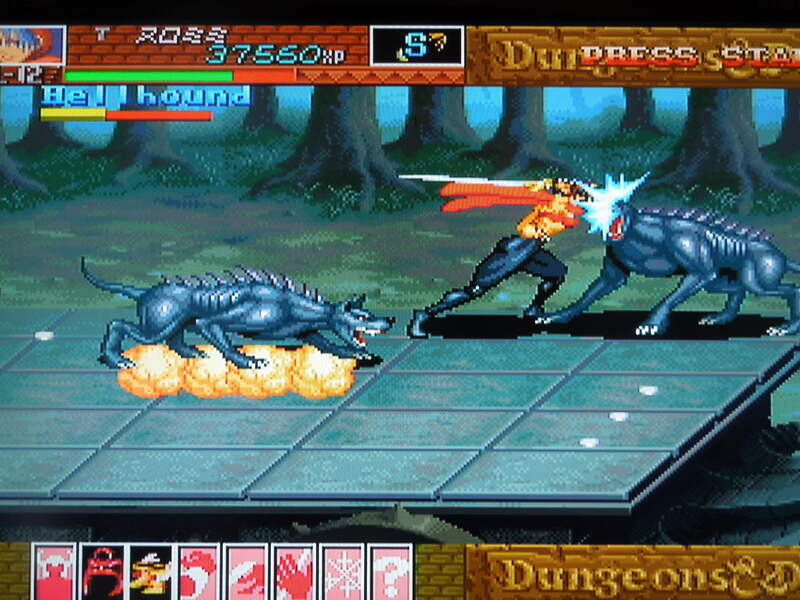 Quick History: Dungeons & Dragons: Shadow over Mystara is a side-scrolling Beat ‘Em Up game with Role-Playing Game (RPG) elements mixed in. It was released for the Sega Saturn in 1999. 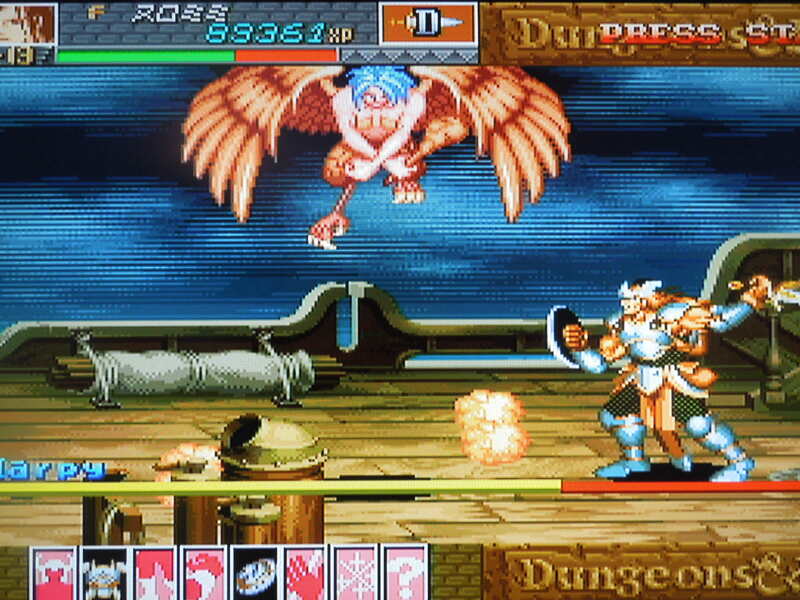 Shadow over Mystara was originally an arcade game released in 1996, and the Saturn version is an arcade-perfect port. The only difference is the number of players – the arcade version was for up to 4 players, and the Saturn version only allows 2 players. 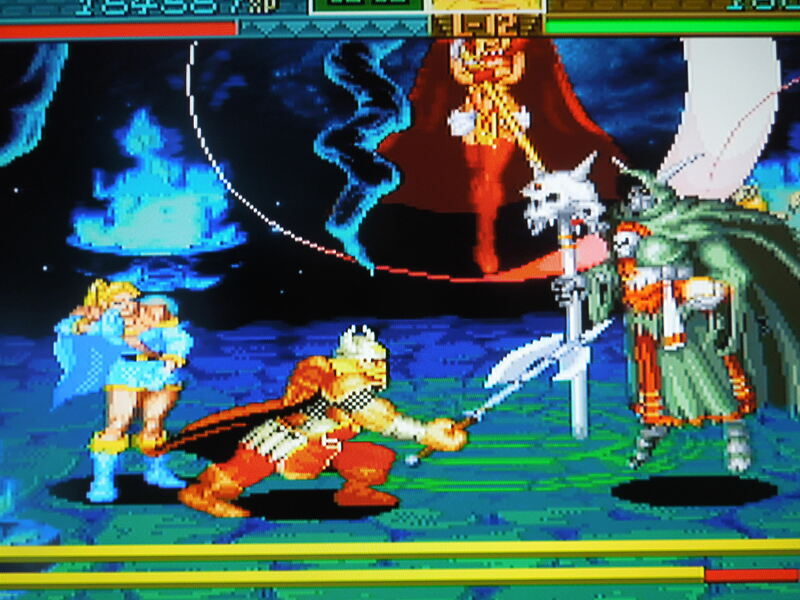 Shadow over Mystara was only released for the Saturn in Japan, unfortunately, and many U.S. Saturn owners never even knew about it, causing it, for me, to fall into the ‘obscure’ category. 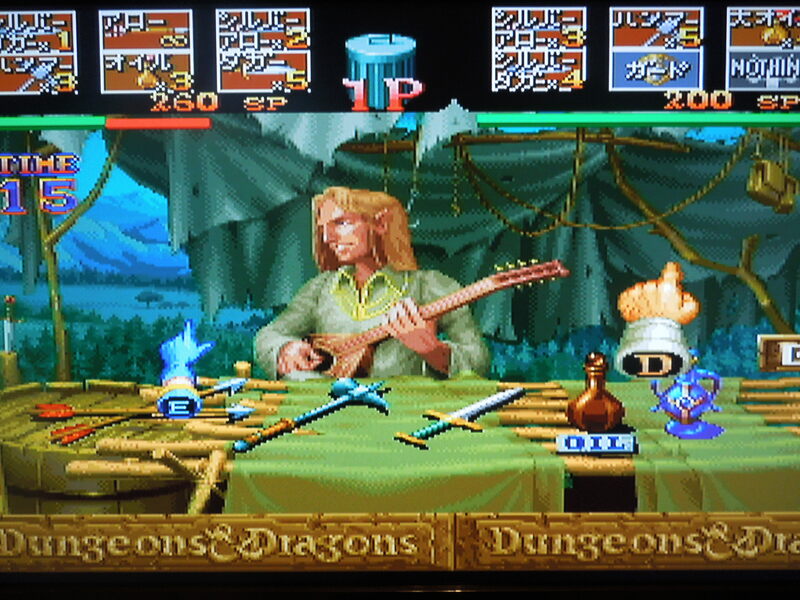 It was released along with its predecessor, Dungeons & Dragons: Tower of Doom (see my review), on the Sega Saturn 2 disc-release Dungeons & Dragons Collection. If you are in any way familiar with the world of D & D, you’ll recognize familiar characters and settings, I’m sure. However, if, like me, you know nothing about D & D, well, that is no reason to stay away from this game – this game requires no pre-requisite knowledge. It is a wonderful medieval/fantastical Beat ‘Em Up, maybe the best in all of the genre. Gameplay: In Shadow over Mystara, you choose from one of 12 characters from the Dungeons & Dragons world: Elf, Dwarf, Fighter, Cleric, Magic-User, or Thief. I listed ’12’ because there are two of each character – 2 dwarves, 2 elves, and so on – each pair looks different, but performs the same. You battle through 10 levels of medieval settings, from mountains, to ships, to towers. Along the way, you’ll battle skeletons, ghouls, ogres, trolls, and all other sorts of fantastical creatures. The bosses are huge – most far larger than the characters you’ll choose to play as. Each character has their own strengths and weaknesses, of course. The Fighter has a long reach with his sword; the Dwarf strikes quickly and a has a great defense; the Elf is quick and has decent magic attacks; the Cleric has a spell, usable at any time, that kills undead enemies; the Magic-User has extremely strong magic attacks; the Thief can open locked chests without having a key. Thieves and Magic-Users join the fight in Shadow over Mystara. Controls: Shadow over Mystara uses 4 buttons: A, B, C, and X on the Sega Saturn controller, although you can change the button layout in the Options menu. A attacks with your main weapon. B jumps. C pulls up a ring of icons that represent weapons or spells your character possesses (ex: knives, a bow and arrows, fireball spell, healing spell, etc.). X uses the weapon/spell. Tapping toward, toward causes your character to run, after which you can press A for a dash attack. Jumping, followed by holding down + A allows for a ‘downward thrust’ move on enemies. Holding down + B allows your character to crouch. Pressing Down, Forward B causes your character to slide, picking up treasure that you find quickly. Pressing Down, Toward, A causes your character to do a special attack. 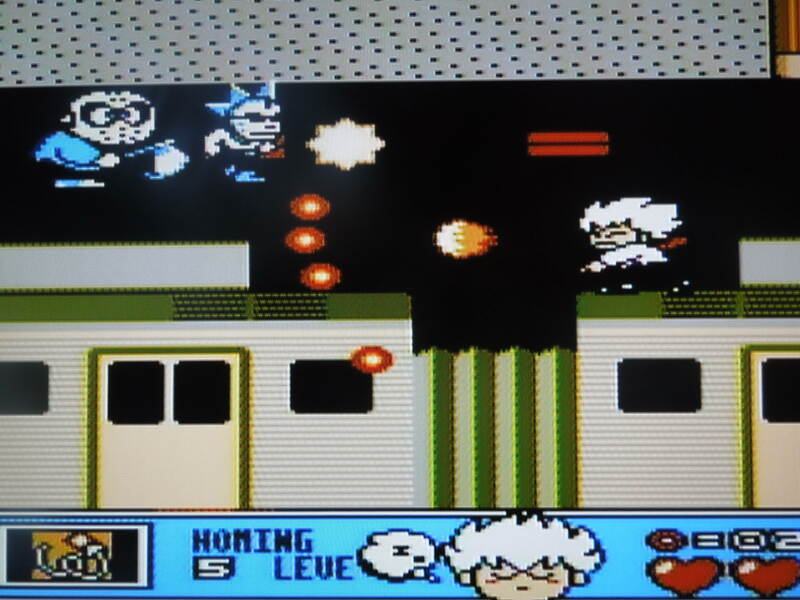 An additional special attack is executed by pressing Down, Up, A, and an energy-draining special is executed by pressing A + B. You can also hit enemies who are knocked to the ground by standing over them and pressing A repeatedly. While standing, holding back + A makes your character hold up his or her shield to block most attacks (note – the Thief can’t do this because she has no shield). Buy supplies from merchants between levels. Experience Points: As you progress through the game’s 10 levels, you pick up experience points (XP) by defeating enemies and opening treasure chests that contain jewels and coins that increase your XP. *Note: chests can also be booby-trapped, and, in addition to coins and jewels, can contain magic rings that allow you to use healing or attack spells. Your character starts with a green life bar, and every time you take a hit, a portion of it turns red. Once it’s all red, you’re dead. However, after every level you complete, your character will level up, causing your HP (Hit Points) to go up slightly, making your life bar longer for the next level. Your life bar will get longer after every level because of this method. In between levels, you stop in shops, where merchants will sell you health potions and weapons to replenish your alternate weapons (arrows, knives, hammers). Credits: This Sega Saturn version of Shadow over Mystara is set to ‘Free Play,’ meaning you can continue anytime you lose a life. While this means you can complete the game easily, it would have been nice had there been an option to include a set number of continues for a greater challenge. With the Free Play option, you simply have to challenge yourself to try and see if you can beat the game without losing a life, or three lives, or whatever you think you’re capable of. 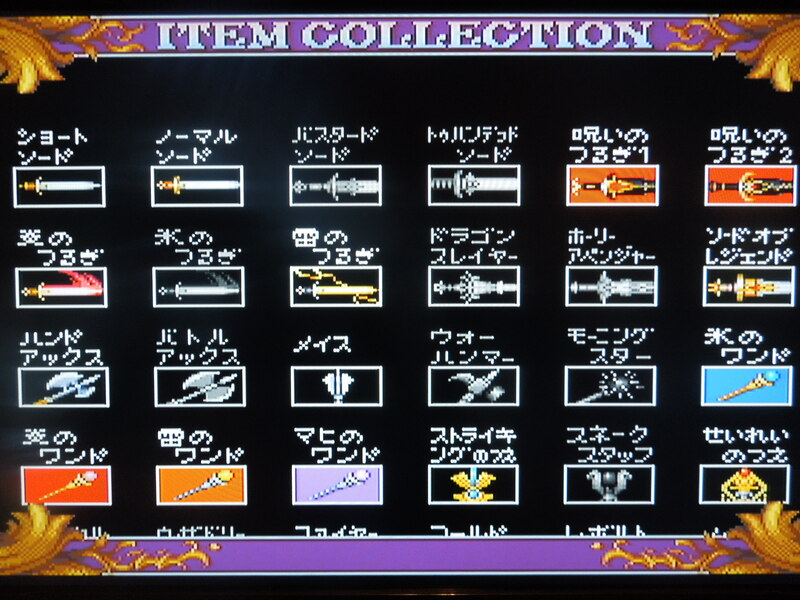 The game saves the weapons and armor you collect in an ‘item gallery,’ with your objective being to find every single one that’s hidden in the game. Sound & Music: Everything’s perfect. The music is very…medieval, I guess you could say. Very sweeping and appropriate for gameplay. The sound is excellent. The ping of an arrow shattered on an upraised shield, the fwooosh of a fireball sent flying at an enemy, the Battle Cry of your character – all are awesome. Many characters yell out things in Japanese as their battle cries. Graphics: Characters, enemies, background, attacks, spells – all come together cleanly to create a fantastic game experience. If you are playing this game on your Saturn, make sure you are using S-Video cables and not regular composite AV (red, yellow, white) cables. 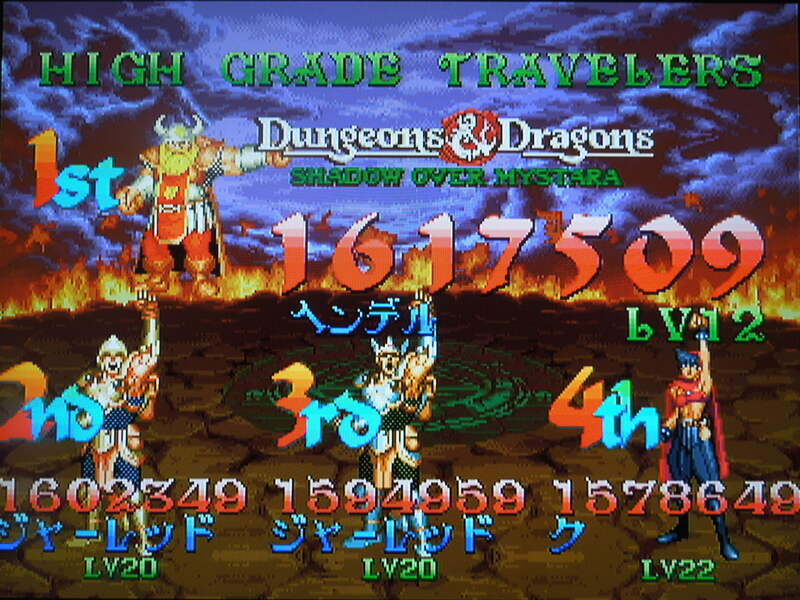 Everything is sharper with S-Video, especially on games like Shadow over Mystara. The Thief is quick on the offensive. Loading Times: Shadow over Mystara does have loading times when you power on your Saturn, between levels, and in-level as well. In-level loading can occur when you walk through a door or a hidden passage – the next screen sometimes has to be pulled up that way. You’ll also have slight loading times if you change characters when using a Continue. You’ll see a ‘Now Loading’ screen with a pointing fairy when the game has to load a new screen. Some loading screens are quick, some are a little longer. While it would be great had no loading times been included, they do not ruin the game. Language Barrier: No and Yes. No, if it comes down to the true answer. This is a Beat ‘Em Up first and foremost – walk right, bash the enemies, fight a boss, repeat. However, despite the fact that the Options screen, the character classes (Fighter, Thief, etc.) and other parts of the game are in English, the story is in Japanese, and at some points in the game, your character must make a choice about what to do next. This gives the game great replay value, but unless you read Japanese, you won’t know the difference between Path 1 and Path 2. All you need to do is find a translation guide online (google Shadow over Mystara FAQ), print it out, and you’ll know what you’re choosing. You can save your high score after you beat the game, or after you choose not to continue. Saving your high score: If you choose not to continue after you’re killed, if your score is high enough, you have the option to save your score to the high score screen (after the Continue? clock has ticked to zero). If you beat the game, after the credits, the game will ask you, in Japanese, if you want to save your score. Select ‘Yes.’ The game will save to the Saturn’s built-in lithium battery. You can always copy your save files to the 4M Action Replay cartridge, too, since the lithium battery needs to be replaced every 5 years or so. To see your high score after saving, wait until the demo plays that displays the top 20 high scores. Options: You can set the difficulty from 1 (easiest) to 8 (hardest) stars. You can also change the control scheme on your Saturn controller, assigning the 4 button commands to any button you wish on your controller. Where can I find this game? If you want to play a hard copy of Shadow over Mystara on an actual game console, this is one of your only choices. You can buy it on eBay, but you’ll probably have to order it from Japan. You can always buy the arcade cabinet, which is available in English and can accommodate 4 players. That’s tough to do unless you have a ton of money, however. As of 2013, the game is available for download on the Playstation Network, Xbox Live, and Nintendo eShop. For the Playstation 3 in Japan, a hard copy disc was released in August 2013. Because the PS3 is region-free, you can import it for play on a U.S. PS3 (I’m unsure whether or not there is an English language option for that disc, however). Both the download versions and the Japan-exclusive disc contain HD graphics, 4 player online support, trophies, etc. The bosses in Shadow over Mystara are as diversified as they are incredible-looking. Conclusion: Dungeons & Dragons: Shadow over Mystara, like Tower of Doom, is an excellent game. 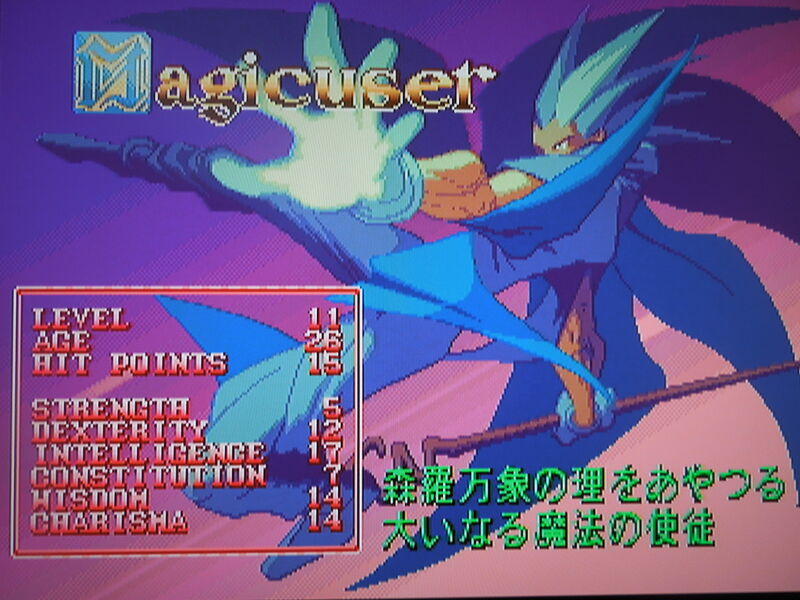 It looks slightly better than Tower of Doom, with more screen-filling magic attacks than its predecessor. The branching paths give the game great replayability, as does the fact that you can save your high score and items in the Item Gallery (note: you can’t ‘use’ the items once they’re in the gallery, it’s just an incentive to replay the game to try to collect them all). Like Tower of Doom, the game would be improved if it gave you the option of having a set number of Credits instead of infinite Credits, but that doesn’t really take away from the game. The loading times in this game are longer than Tower of Doom, but the game is so fun that it doesn’t ruin the experience. Is it better than Tower of Doom? I find that question debatable, and personally, I prefer Tower of Doom to Shadow over Mystara. The games are extremely similar, mind you. This game is a bit longer than its predecessor, and it will take you around an hour and a half to beat it, assuming you’re taking the time to enter secret passages and defeat most enemies. Wouldn’t it be easier to play the PS3 version, which has English, HD graphics, up to 4 players instead of 2, no loading times, and online play including trophies and different objectives? Here’s the truth – I downloaded the PS3 version and it was terrific – but I didn’t enjoy playing it as much as the Saturn version, and haven’t played it much since I downloaded it, although I have played through Shadow over Mystara on the Saturn several times since then. Why? I don’t know – there’s just something about the nuisances of the console version that a download can’t replicate, even if it is technically superior in every way. Maybe some of you out there reading this can understand that, even if it’s crazy. This entry was posted in Sega Saturn - Dungeons & Dragons: Shadow over Mystara and tagged Dungeons & Dragons: Shadow over Mystara Review. Bookmark the permalink.